Edo, the prominent city where the Shōgun resides. From all over the country, all kinds of strong warriors gathered there. And in order for them to show their skills, martial art dōjōs were established in every direction. It became a place where swords were drawn night and day, and turned into one of the largest battlegrounds in the land. One spring, yet another dōjō had been opened in the same area by a man. That man was called Yukiji Kurotsuki. He appears weak and looks not at all dependable, on top of that his school (style of fighting) did not use the common tool needed for combat, "a sword.゛ So obviously, there were no students who wanted to come join this dōjō and could hear the sounds of the crickets chirping from within the place. What is the pain the boy carries, and the promise that changes the fate of Kurotsuki and his dōjō?! Right now a new dream is about to unfold in the city of Edo!! A genuine Edo martial arts tale begins!! 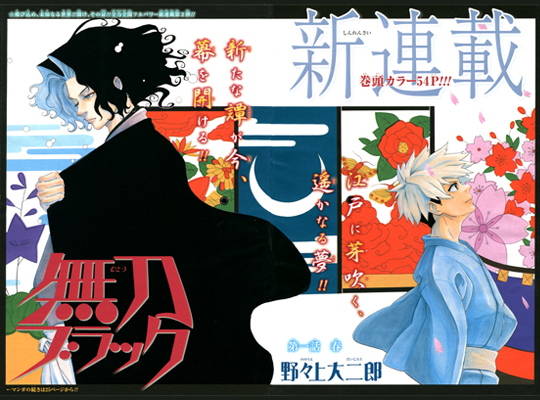 Mutou Black began in volume 25 of Weekly Shonen Jump. This is Nanoue-sensei's first work but the series somehow reminds me of Gamaran from Weekly Shonen Magazine and also Rurouni Kenshin (without the romance) from Weekly Shonen Jump.